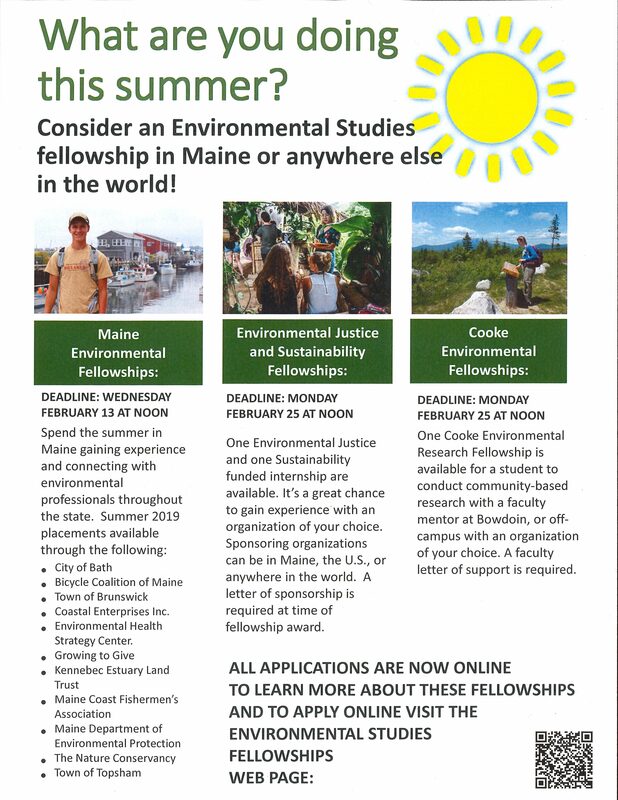 Consider an Environmental Studies Fellowship in Maine or anywhere else in the world! It is the belief of the Grassroots Fund that the involvement and leadership of young adults (defined as up to 25 years old) in environmental justice community organizing is a critical component in fulfilling the Grassroots Fund’s mission of creating sustainable communities. The Young Leaders grant program seeks to support initiatives that allow young adults to design, lead, and engage a community-based effort from inception. Environmental Fellowship program descriptions and applications for Summer 2019 are on the ES website! As a student who is either an ES major/minor or who has taken ES core courses, you are eligible to apply for Environmental Studies summer fellowships. The Environmental Studies program provides 15 summer fellowships for students. Read more about last summer’s fellows. This is a great way to gain experience in the field, work with environmental professionals, and connect your summer experience to your academic experience. The Environmental Studies Program is one of very few academic programs that has an endowed fellowship program. Environmental Studies Fellowships (Sustainability and Environmental Justice) (2-3) – funds students to work for an organization of their choosing. You can work in Maine, in your community, or anywhere in the world. Feel free to email me if you have any questions at all. 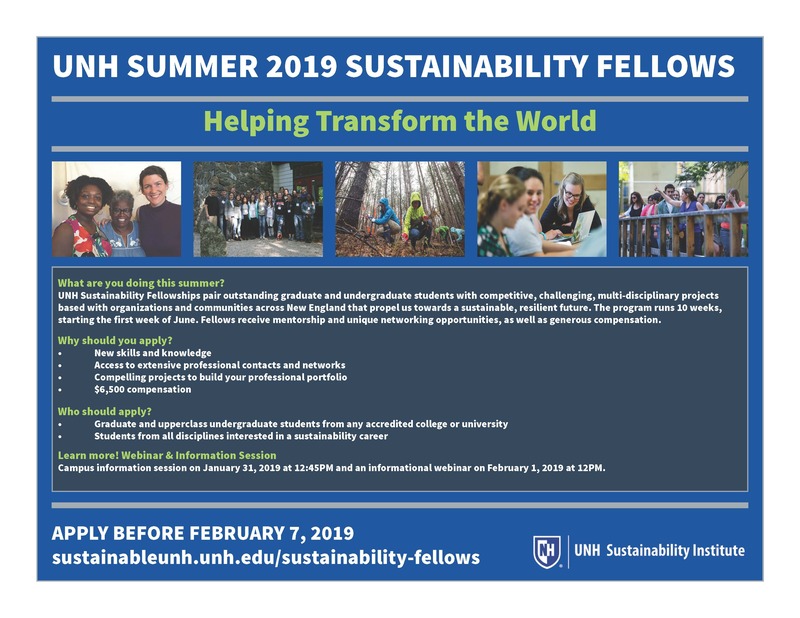 UNH is excited to announce that applications are now being accepted for the 2019 Summer Sustainability Fellowships. 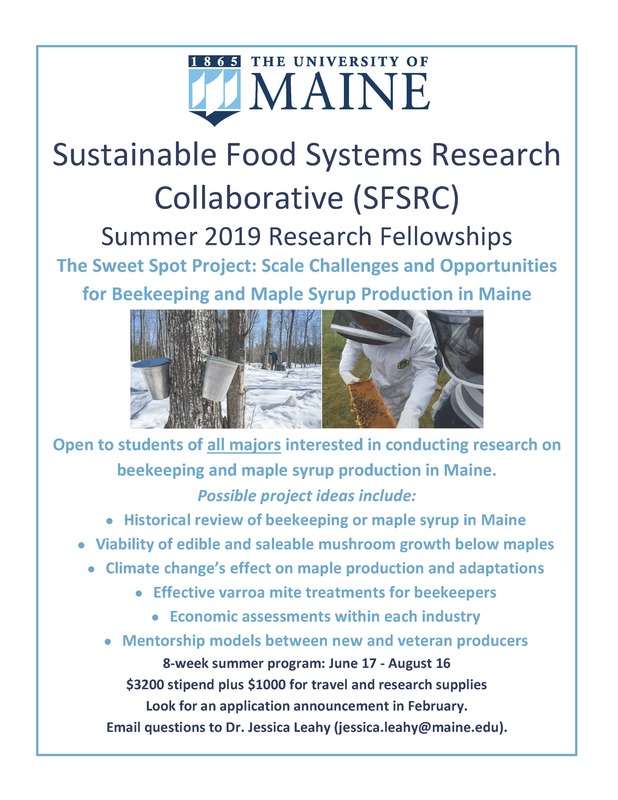 Sustainability Fellowships are a fantastic opportunity to gain unique hands-on experience, make valuable connections throughout New England, and contribute to impactful work over the summer. Graduate and upper-class undergraduate students from any discipline are encouraged to apply. See below for details on the 2019 Fellowships – more information is available on our website. We’ve also attached a flyer – please feel free to post or share. All are welcome to attend the info session or webinar next week. The Environmental Fellowship program descriptions and applications for Summer 2019 are now on the ES website! Environmental Studies-Maine Based Fellowships (12) fund students to work with local communities and nonprofits in Maine that are selected as host organizations by the Environmental Studies Program. We have now posted our placements for our Maine based fellowships. We have 12 opportunities for students to work with environmental organizations on everything from sustainable communities, energy policy, water quality monitoring, environmental health and more. Deadline: Wednesday, Feb. 13th at noon. In 2015, the Environmental Leadership Program was invited to co-design and manage the Roger Arliner Young (RAY) Diversity Conservation Fellowship. The RAY Fellowship was created to address the lack of racial diversity within environmental conservation which is a persistent problem that is becoming increasingly recognized. Recognizing that diversity is a value important to the conservation sector and that we have not always made the progress we strive to make, we seek to work together to help rectify this shortcoming by striving for greater diversity, equity, and inclusion in conservation. Not only is it intrinsically incumbent upon our sector to change practices that contribute to the lack of people of color, but addressing this problem will also make our work more relevant, accessible, and successful. To this end, the Roger Arliner Young (RAY) Conservation Diversity Fellowship focuses on increasing opportunities for people of color to learn about, engage with, and enter the environmental conservation NGO sector. The Fellowships will be designed to support and attract recent college graduates of color with exceptional promise and demonstrated accomplishment who seek to be leaders in the nonprofit and philanthropic sectors. In July 2019 the RAY Fellowship Program will welcome its 4th Cohort of RAY Conservation Fellows. While marine conservation remains a priority, Year 4 will also mark the Program’s expanded efforts to provide fellowship opportunities in conservation broadly, including land, habitat, freshwater, climate, energy, etc. Please join us tomorrow for an Informational Webinar to hear from RAY Program participants (Fellows and Staff Members at hosting organizations) and learn about the benefits of participating for internal teams and programs at your organization. Bring your energy and questions and we’ll see you then! If you are unable to participate, please feel free to pass along to your colleagues. The 2019 farm season will be here before you know it! Get your hands dirty learning the ins-and-outs of farming or ranching and get exposure to a variety of local and sustainable food systems amid the rugged, breathtakingly beautiful landscape of Montana! Farm Link Montana is a free, searchable database of current listings for jobs, internships, and land opportunities in Montana. It features a searchable map of farms and ranches across the state hiring for the upcoming season. Learn about each operation and apply to multiple jobs at once with just one application. Opportunities range from organic veggies, wheat, and pulses to hops, dairy and more! Now is the time to apply! Hiring for the season is underway so don’t miss out!